From palm trees to pyramids, both spooktacular additions are available as in-app purchases for just $0.99 each. Pick them up from within Hotel Transylvania Dash, available now on the App Store. Wayne loves to have a howling good time at Hotel Transylvania. Make sure he gets bones for his noisy pups! You can usually spot Griffin, the Invisible Man, in any group photo…or can you? Griffin loves to have his photo taken with all his spooky friends! The Gargoyles love to hit the gym and enjoy the view at Hotel Transylvania. If you can’t find them in their room, check the roof! The cute Mummy is a fashion icon in any century! Make sure to deliver both of her suitcases to her room. To access the new levels and characters, along with the original game, download Hotel Transylvania Dash for free on iPhone, iPad and iPod touch via the App Store. Hotel Transylvania Dash is based on the popular animated comedy from Sony Pictures, Hotel Transylvania, and represents the latest game in the successfulHotel Dash series from PlayFirst. In the game, players help Dracula create and manage a lavish resort exclusively for monsters. (No humans allowed!) Guests include the charming characters from the movie, including Murray the Mummy, who adores the hotel’s signature Worm Cakes; Frankenstein, who has a tendency to sleepwalk; and Wayne the werewolf, who travels with an entourage of pups. Players are sure to have a frightfully fun time helping Dracula book rooms, deliver room service, and attend to guests’ needs while preparing a special 118th birthday surprise for his vampire daughter, Mavis. Dracula is in for a surprise when the human Jonathan stumbles into the hotel – the first human ever to discover the monsters-only retreat! 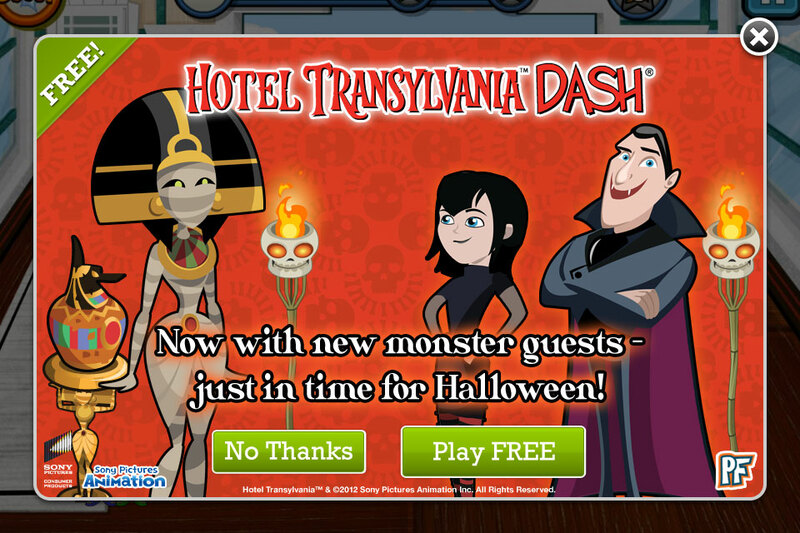 Download the full Hotel Transylvania Dash press kit, including assets from the expanded content, by clicking here. Welcome to the Hotel Transylvania, Dracula’s lavish five-stake resort, where monsters and their families can live it up, free to be the monsters they are without humans to bother them. On one special weekend, Dracula has invited some of the world’s most famous monsters — Frankenstein and his wife, the Mummy, the Invisible Man, a family of werewolves, and more — to celebrate his daughter Mavis’ 118th birthday. For Drac, catering to these infamous friends is no problem — but his world could come crashing down when a human stumbles on the hotel for the first time and befriends Mavis. Directed by Genndy Tartakovsky. Produced by Michelle Murdocca. Screenplay by Peter Baynham and Robert Smigel. Story by Todd Durham and Daniel Hageman & Kevin Hageman. PlayFirst’s mission is to be the world’s first choice for fun. Through the success of worldwide megahits likeDiner Dash®, PlayFirst has become the leading creator of mobile fun for family and friends. With over 650 million downloads worldwide, games in the Dash portfolio, including Diner Dash, Wedding Dash®, Cooking Dash®, Hotel Dash® and SpongeBob Diner Dash®, are the global leaders in time management mobile games. PlayFirst games are crafted using the PlayFirst Recipe for Fun™ which uniquely combines brand, characters, relatability, engagement, authenticity and quality, with feedback from its worldwide player base, to create hit after hit, including the most recent hit freemium game, Mall Stars ®. For more information, please seewww.playfirst.com. Sony Pictures Animation produces a variety of animated entertainment for audiences around the world. The studio is following its worldwide comedy hits—the 2011 hybrid live action/animated family blockbuster, The Smurfs (3D) and the 2009 mouth-watering Cloudy with a Chance of Meatballs (3D)—with the family comedy Hotel Transylvania (3D) in September 2012 and the Smurfs 2 (3D) in July 2013. Sony Pictures Animation, in conjunction with Aardman Animations, has produced two critically acclaimed feature films: the CG-animated family comedy Arthur Christmas (3D); and the stop-frame animated high-seas adventure, The Pirates! Band of Misfits (3D). In 2007, Surf’s Up received an Academy Award® nomination for Best Animated Feature Film. The division, whose first feature film Open Season led to a very successful movie franchise, is turning 10 this year. Sony Pictures Animation is an operating unit of Sony Pictures Digital Productions.